Like most writers, and not just music journalists, I sustain myself financially with a demeaning, underpaid yet unduly stressful and arduous day-job in an office. The multinational firm who employ me, being fifteen years behind the times in terms of progressive thinking who have in the last year and a half decided halt the future is digital and that the place to pitch for market share in the coming years is on-line, have gone all blue-sky thinking and have fitted out a large rectangular room in each office with rising rows of seats, like some hideous postmodern parody of a colosseum in MDF. These ‘in the round’ meeting rooms, where the speakers stand in the middle (and consequently have their back to a quarter of the audience at any given time) have been preposterously named ‘agoras’. While throwing out quips about fluffy rabbits and jumpers, I’ve managed to decline all meetings in said room by claiming to be agoraphobic. The reason for this preamble is that this album’s title is something of a play on words, a hybrid of ‘agoraphobia’ (a fear of public or open spaces) and the suffix ‘phone’, meaning sound. It only half works, in that phonia and phonic tend to refer specifically to speech. And, as anyone with access to a computer will likely know, ‘agora’ (in reference to either a space in an office or a word which simply means ‘public’ or ‘outdoor’) is a misnomer, in that the term ‘agoraphobia’, coined by the German psychiatrist Carl Friedrich Otto Westphal, was taken from the Greek ἀγορά, meaning ‘large public square/marketplace’ and -φοβία, -phobia, meaning ‘fear’. Still, based on the popular perception of the two terms, it makes an obvious punning sense which works in the context of what the album is about, in that it’s ‘a work which explores the relationships between people in given environments, and is specifically set in public spaces, namely the squares, or plazas’. One might broadly classify this as a work of ‘ambient’ music, but in drawing together field recordings and manipulating the sounds and incorporating them into the rich sonic tapestry that constitutes samples and shimmering drones which form the material of Agoraphonia, Giannico and Aldinucci have gone far beyond the realms of background music and of atmospherics. 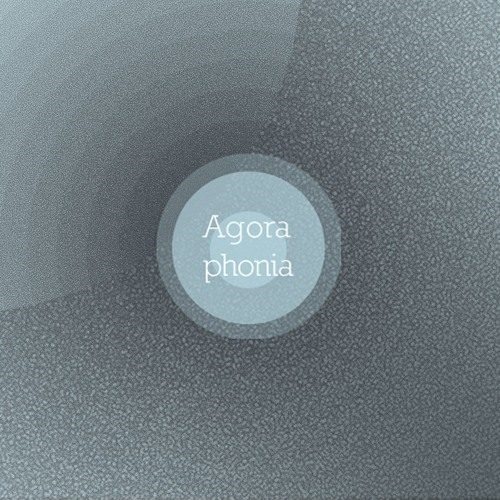 Agoraphonia is a deeply evocative work, and one that requires a substantial degree of attention and focus. Created using sounds submitted on-line, the album is a new kind of collaboration, and the end result is a work that requires attention and contemplation. Voices, passing cars and motorcycles and a low-level continuous chatter run through an indecipherable public speech seemingly made outdoors – at least judging by the trebly, tannoy echo – run through the first track, ‘Koutoubia’, as long, lingering drones simmer and eddy, building slowly in volume and intensity. ‘Plaza de Mayo’ finds the soft drones upscaled to vast, multitonal sonic washes which all but obliterate the voices audible at the start and end of the track. But this (im)balance is integral to the album’s purpose. In the world, the voice of man is not always dominant, and the relationship between human life and the environment it has created and inhabits is one which is infinitely variable and in constant flux. There’s also the relationship between public and private, which at times is uneasy and for some extremely difficult and in some respects the recordings here are manifestations of that seemingly eternal fascination which surrounds the two states, which do not necessarily stand in diametric opposition or exist in binary formation. Giannico and Aldinucci do not offer answers here, but instead provoke thought as they lead the listener through the various locations.